Napier, North Island, NZ. 10th January 2015. 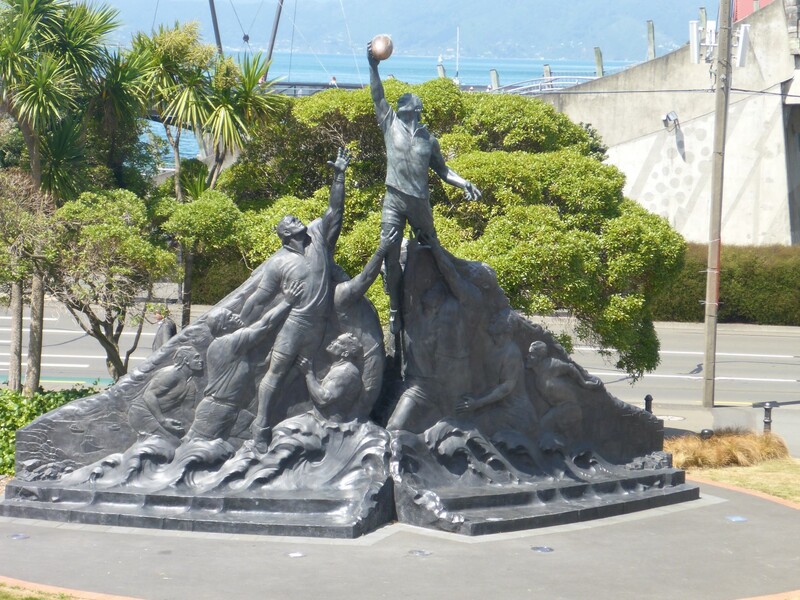 Napier is a place that has experienced both tragedy and triumph. 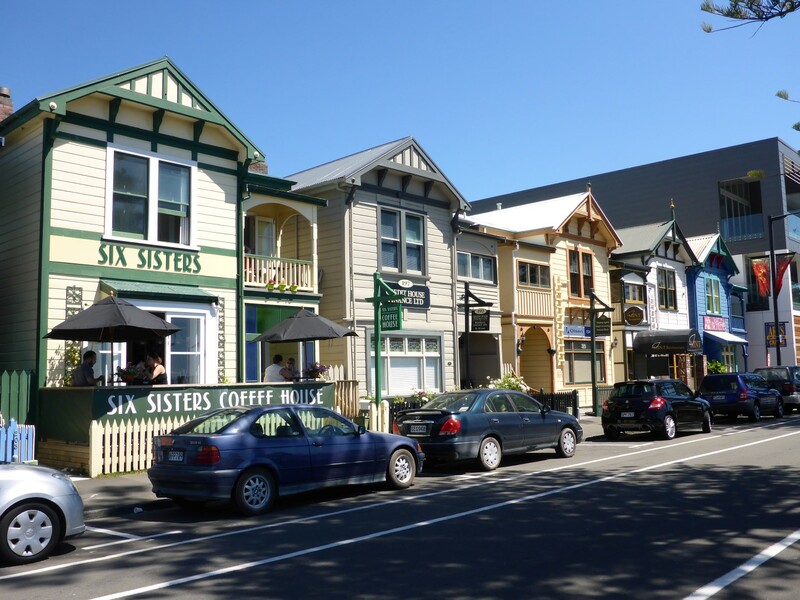 It sits by the sea at Hawkes Bay, on the east coast of the north island, and is a very pleasant seaside town. But in 1931 it suffered a devastating earthquake, 7.8 on the Richter scale, which completely destroyed the town centre. Buildings that weren’t flattened by seismic activity were destroyed in the subsequent fire. Most of the buildings were brick built and just fallen apart. One hundred and sixty one people died and there were other casualties in nearby towns too. Fortunately some old buildings survived. 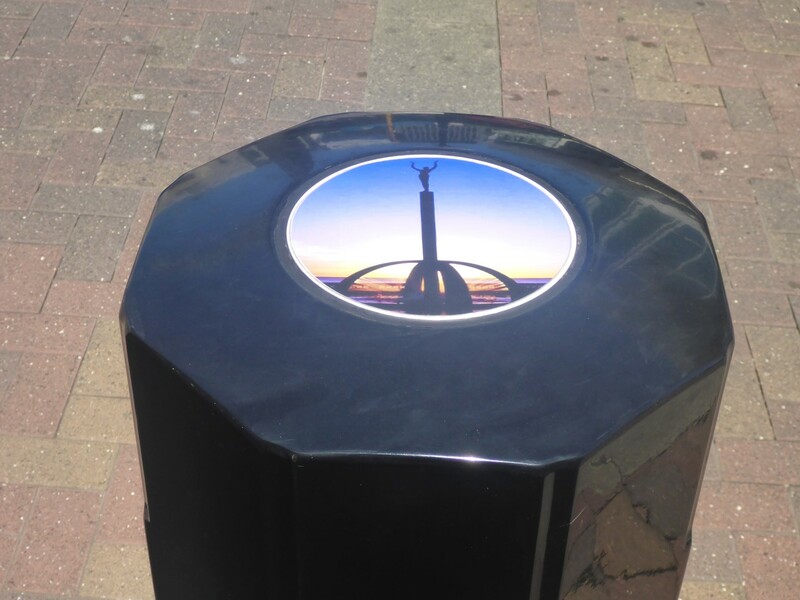 These are along the seafront. But thanks to the efforts of two government appointed commissioners the town centre was rebuilt within two years. 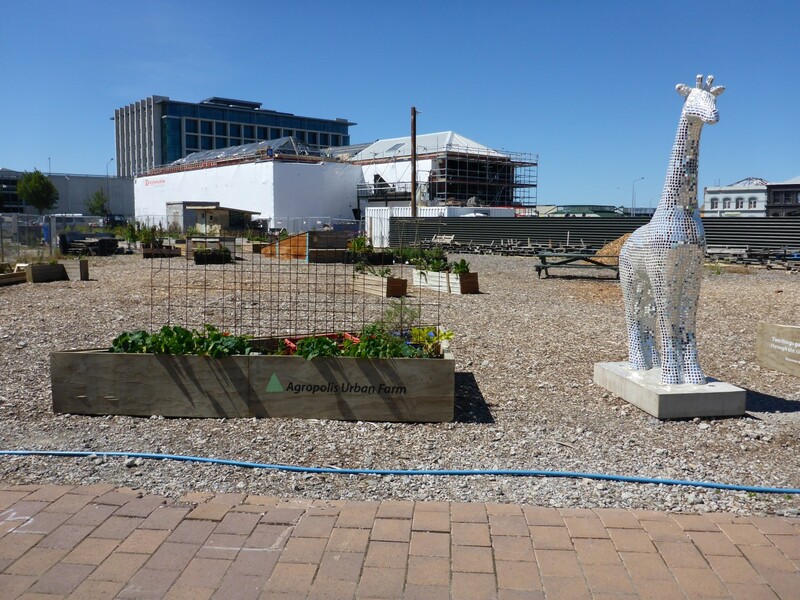 They immediately set to work on creating Tin Town, an area near the seafront where temporary shops and offices were built to enable the town to function. Within two years most of the rebuilding was complete. The commissioners made use of the four architectural practices in the town and they used the Art Deco style, the Spanish Mission style a couple of others. 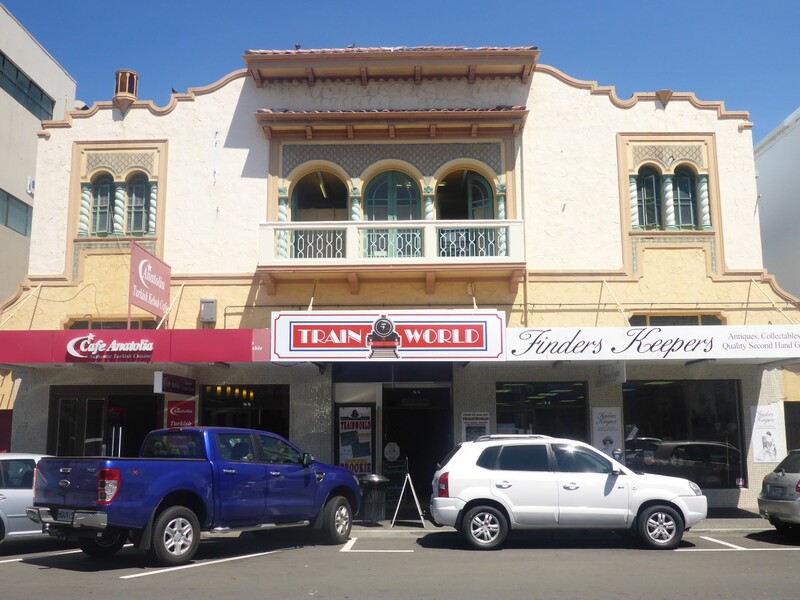 Most were Art Deco and although some have been replaced with modern buildings over the years, the majority remain thanks to the town council’s recognition of their value as a cultural and tourist attraction. Restoration and conservation has been carried out and the result is a town centre that gleams in the sunshine. 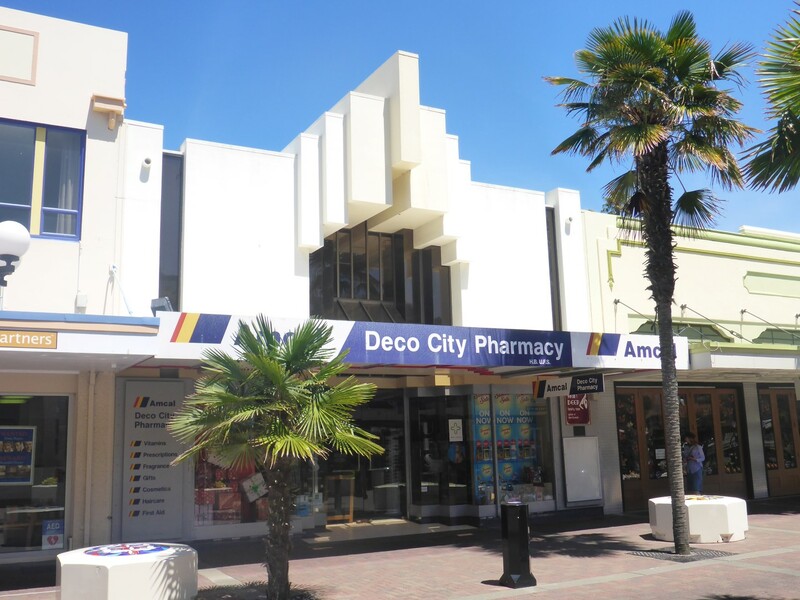 Art Deco town centre building. With their pastel shades and classic lines, the buildings are a magnet for architecture lovers around the world and the town is considered to be unique. The CBD is bordered by the main road which runs close to the sea. The quake caused the sea shore to rise up by 2.7 metres and the extra 100 metre width of shoreline was filled in with the rubble from the town and is now a fantastic public space, with a market, skateboard park, flower garden etc. The quake giveth and the quake taketh away. 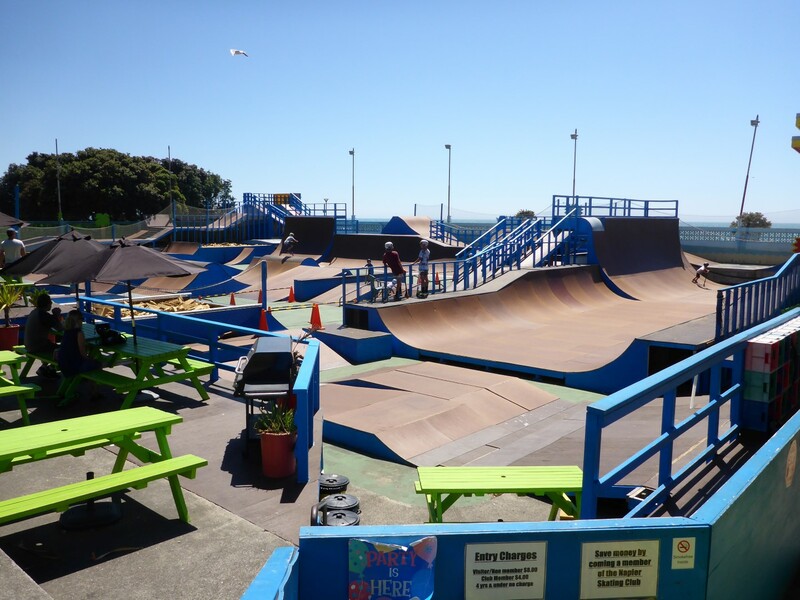 Seaside skate park. Bikes and boards too. 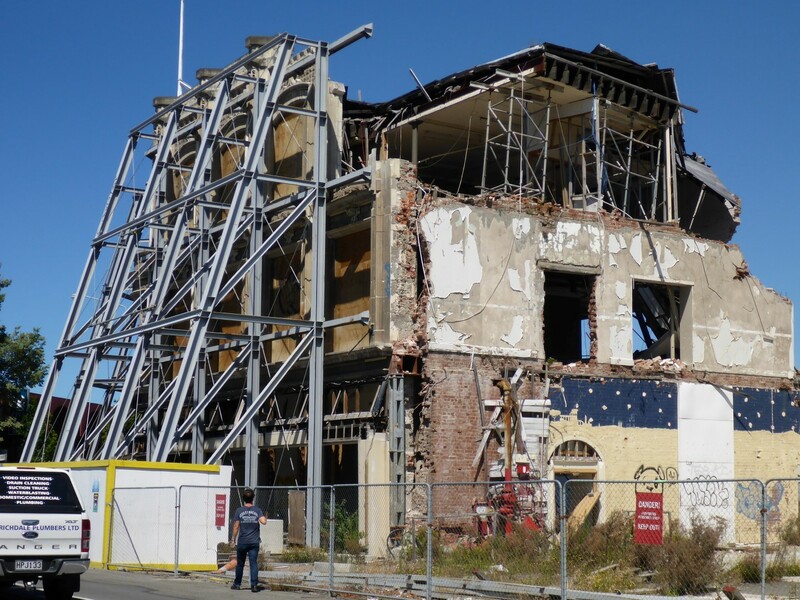 As well as gaining some extra land, another benefit was to make the NZ government review all its building codes and impose rules that made new buildings far more able to resist the effects of being shaken apart. Reinforced concrete was favoured for commercial buildings as they had survived best, and it was decided to put services underground. So Napier led the way for the rest of the country. Something positive out of the disaster. For my part I really loved the town centre and was very taken with the buildings and the tree lined streets. I was quite puzzled though, by the number of buildings that seemed to be for sale or lease. I couldn’t quite see why this was and subsequent conversations with locals didn’t really give me an answer. Maybe it was just time for the release of the lease? Lovely building, yours if you want it. I took a walk up Bluff Hill, where the view across the bay was fabulous on this sunny day. Below me was a busy port, dealing with containers and logs. The route up took me through an almost hidden park where shady trees housed some of NZ’s small, native birds, such as the Fantail. It had been designed by an Austrian biologist who wanted to create a restful, peaceful place for the townsfolk. I think he succeeded. A view of the port. The town has a great museum, The Museum, Theatre, Gallery (MTG). Obviously it covers the earthquake, with some very moving personal testimonies, but it also has a big section relating to NZ’s first female Maori MP, Tini “Whetu” Marama Tirikatene-Sullivan. She was a forceful character and set a very modern tone for the 1960’s. She insisted on there being facilities to enable her to bring her children in to work with her and she very deliberately took the Maori style and pattern of dress out into the wider world with her. She became Minister for Tourism and then for the Environment in the 1970’s. 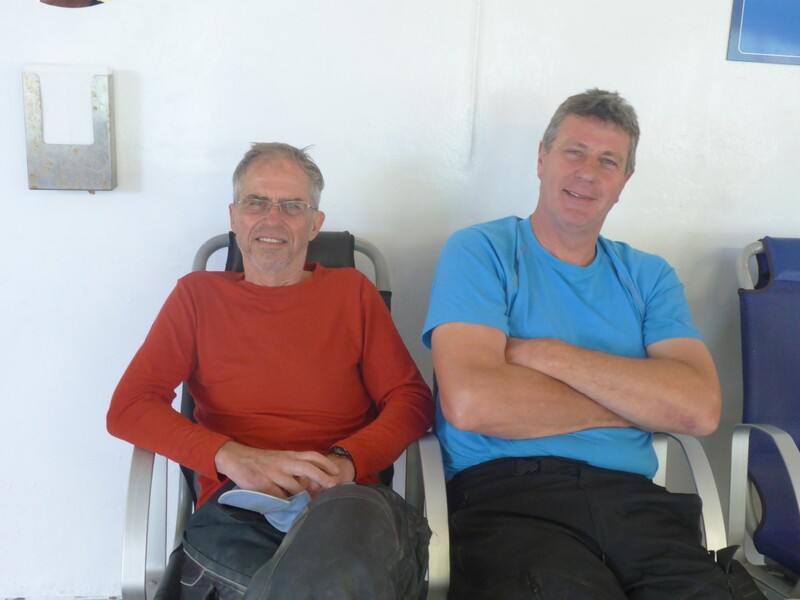 While in the hostel I got chatting to Overt, a German Kiwi who was sailing his way around NZ. He was retired too. He explained to me all about WOOFers. WOOF stands for Worker On an Organic Farm, although the term is now used for anyone who works their way around the country. A young French couple were in our room too and they were looking for work on one of the fruit farms. Overt said that Kiwi’s didn’t want that kind of work as it was at minimum wage so there was plenty of it for the Woofers. I came across lots of young Europeans, German, French, British etc., who were on a one year work visa and were having a great time. Many of the hostels, like those I’d stayed at in Europe, allowed people to earn their bed, usually with a couple of hours cleaning. A great way to fund a travelling holiday. The other useful thing I did at the hostel was to join BBH – Budget Backpacker Hostels. Membership gives a $3 discount at their member hostels as well as a 10% discount on the Inter Islander Ferry, the main ferry between the two islands. I knew I would get my $45 back pretty quickly. A German visitor of a different kind, and perfectly in keeping with the rest of town. Napier now done and dusted, I hit the road for Wellington. On the way I stopped for a coffee and had one of those chance meetings that result in a new friend. Another biker pulled in at the café, an American named Geoff. Firstly I was impressed that his parents knew the correct spelling of our name. Secondly I was interested to hear that he had flown in for a two week holiday and had hired a BMW GS650 to tour on. The hire company had worked out an itinerary and booked his accommodation for him too. He works as a rocket scientist and spends his precious leisure time enjoying biking trips in various countries. We had a great chat and he insisted I visit him when I eventually get to the States. I surely will! Geoff, with hired BMW. One of those great chance meetings. The owner of the Suzuki bike shop across the street wandered over for a chat and he listened to my rattly engine. Cam chain, in his opinion. The engine was still noisy but no worse than before. I’d been riding with everything crossed – a good trick if you can do it – and I didn’t have too far to go now. So I set off for Wellington in a confident mood and yes, you’ve guessed it, just outside the city nothing whatsoever happened and I got there with no problems. Was I ever pleased! The big and busy city centre hostel had two things that I particularly liked. Free breakfast and free dinner. OK, the breakfast was just pancake mix that I had to cook myself and the dinner was only starter sized, but I could upgrade it for a couple of dollars and it was always nice. I’d booked in for five nights as I didn’t know how long it would take the shop to fix my bike. I took it up to Red Baron’s next morning, showed the mechanic how to get the seat off, told him not to throw away my cleanable oil filter and left him to it. 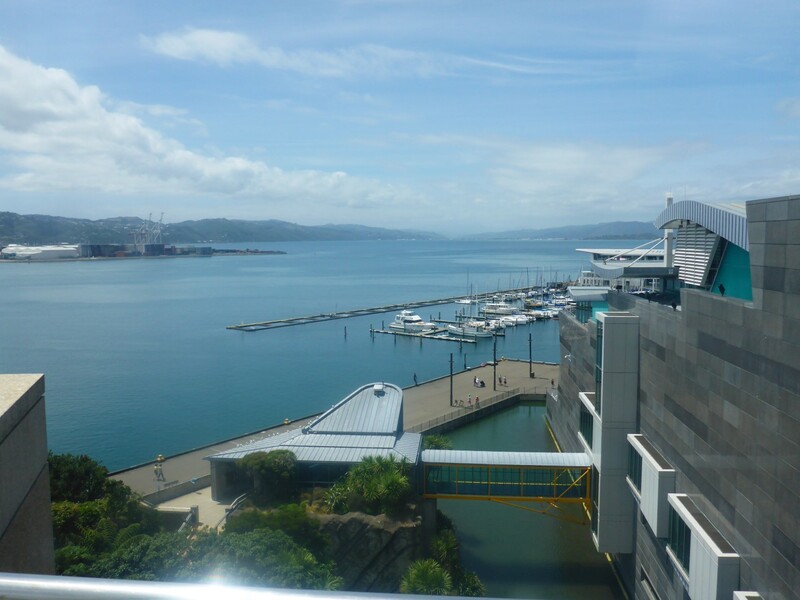 After a bus ride back to town I headed for Te Papa Tongarewa, the New Zealand Museum, situated on the quayside. What a fascinating place. I wandered around there for more than four hours before hunger drove me out. The exhibitions were mostly about the natural forces, ancient and modern, that have shaped NZ; the Pacific and European immigration stories; the Treaty of Waitangi; plus more general exhibitions about dinosaurs and art etc. Well worth the time spent especially in that it increased my understanding of NZ’s history. It was free too. The Treaty of Waitangi is modern New Zealand’s founding document. 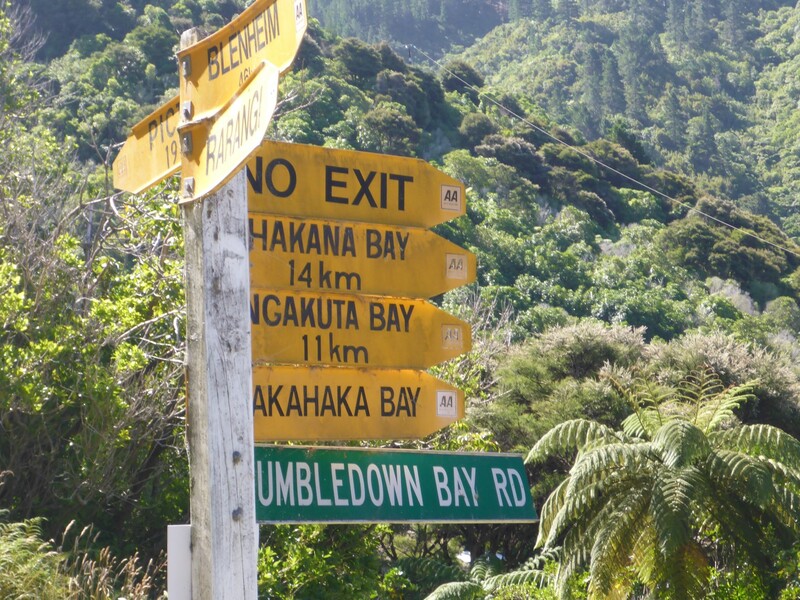 It takes its name from the place in the Bay of Islands where it was first signed, on 6 February 1840. This day is now a public holiday. The Treaty is an agreement, in Maori and English, that was made between the British Crown and about 540 Maori chiefs. Growing numbers of British migrants arrived in New Zealand in the late 1830s, and there were plans for extensive settlement. Around this time there were large-scale land transactions with Maori, unruly behaviour by some settlers and signs that the French were interested in annexing New Zealand. The British government was initially unwilling to act, but it eventually realised that annexing the country could protect Maori, regulate British subjects and secure commercial interests. The fact that the French had their eyes on NZ too meant they had to act fast. The Treaty was prepared in just a few days. 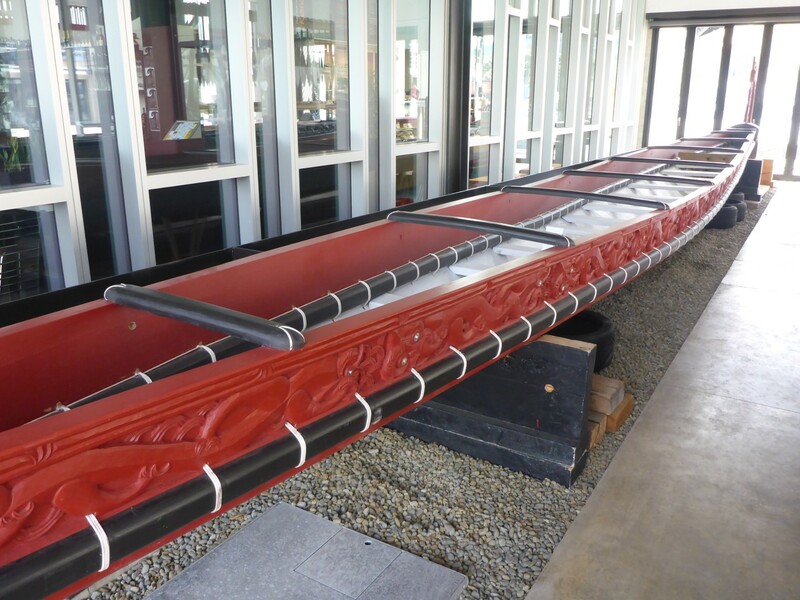 Maori Waka (canoe). Two of these, joined like a catamaran, crossed oceans. Missionary Henry Williams and his son Edward translated the English draft into Maori overnight on 4 February. About 500 Maori debated the document for a day and a night before it was signed on 6 February. Because of the difficulty in translating some of the legal terms into Maori there have since been disputes about exactly what the chiefs signed up to, especially regarding land ownership and rights. Most of them signed copies of it written in Maori but relied on oral explanations too. The Colonial Office in England later declared that the Treaty applied to Maori tribes whose chiefs had not signed. British sovereignty over the country was proclaimed on 21 May 1840. In 1975 a commission was set up to deal with disputes arising from the treaty and to make adjustments to NZ laws where necessary. This is still ongoing but is a genuine attempt to achieve fair solutions to all disputes. Rugby is popular in NZ! While resting up back at the hostel I received a phone call. My bike was repaired. So soon? I was very surprised but also pleased as it clearly wasn’t as serious as it might have been. 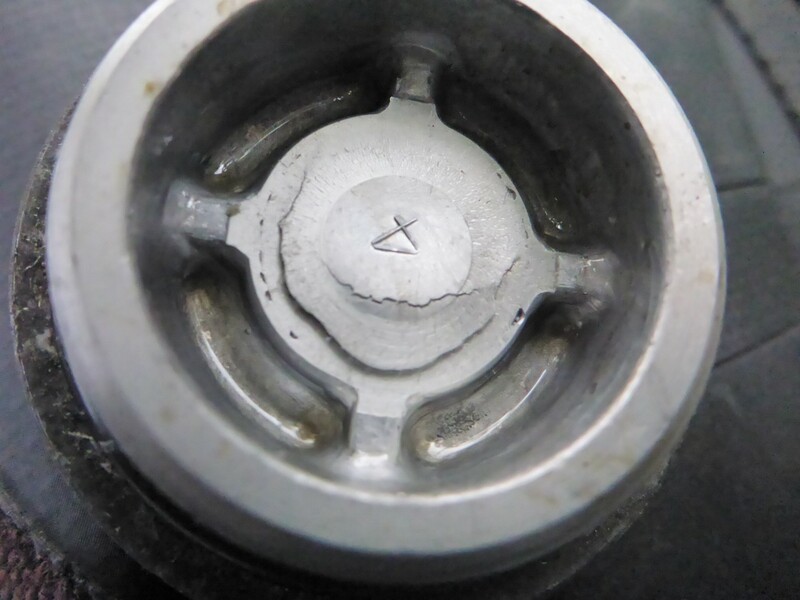 When I got to the shop I was told that the nut on the right hand end of the crankshaft had worked loose, thus allowing the cam chain drive sprocket to move around and the cam chain to shake, rattle and roll. This was the cause of all the noise. Some thread lock and a big spanner effected a cure. I was pleased to have been proved right, even more pleased it wasn’t anything too serious but not at all impressed with the £200+ bill. Most of that was labour charges, at main dealer rates. But it could have been far worse. I was so pleased to have my best girl in fine fettle once more. As I left I got chatting to Stewart, the owner of the business. He invited me to call in for a coffee and a chat on my way north again . Will do! 19th Century port building, beautifully preserved. Tonight was theatre night! I’d fancied a bit of culture and had discovered a small venue, above a bar, not far from the hostel. The play was Richard III. I’d seen it on the TV in the Hollow Crown series on the BBC and fancied seeing it live. It was brilliant! All the lines were true to the original Shakespeare and the young cast did a great job of delivering them in an amusing way while remaining true to the spirit. They threw in some modern ticks, such as pretending to use a key fob to open a door or pretending to use a mobile phone. There were also a few political digs, aimed at NZ and Australian politicians. The venue was small and all the actors were great at conveying the emotions of the characters. This is a very complex play, with many inter-related characters, so they had written all the names on the floor and as each one was bumped off they placed a red cross through their name, just to help us all keep up. It was a real rip snorting performance and great fun to see. Over the next few days I explored Wellington. 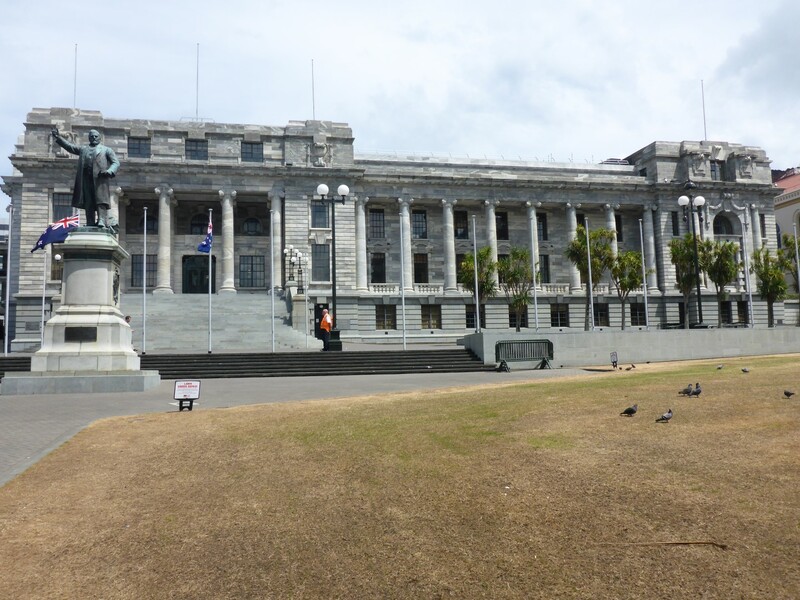 It is NZ’s capital city and houses the parliament buildings and law courts. 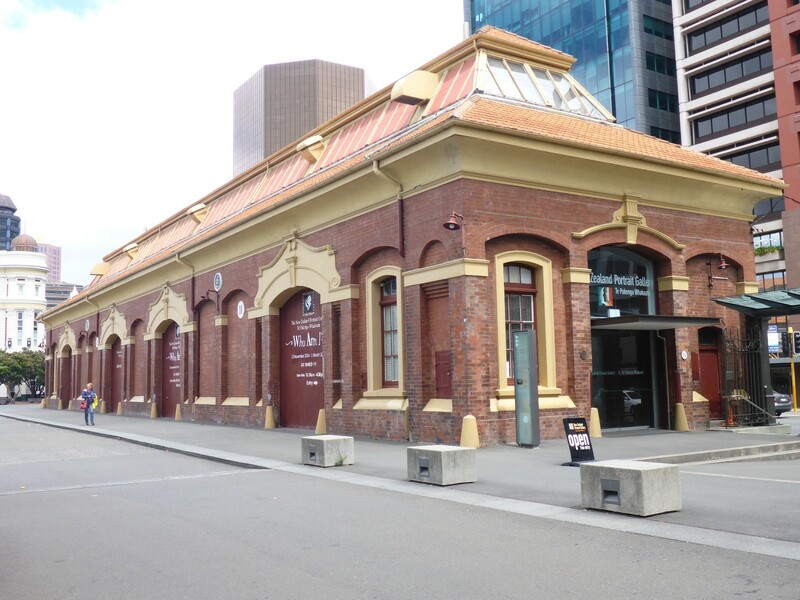 I visited the Wellington Museum, which tells the story of the first settlers’ arrival in 1840; its growth as a port, including some of the tragedies that have occurred here; the local Maori tribes; the 2013 earthquake. ‘Windy Welly’ is the name Kiwi’s give to the city, and with good reason. It sure does blow! There was a ferry disaster in 1968, when a boat was blown onto rocks following engine failure. The earthquake wasn’t too serious but I was surprised to see yellow notices on some of the older buildings saying that the owners had until 2020 to make them quake proof or pull them down! That seemed a bit harsh but experience in other parts of NZ suggest it to be necessary. New Zealand is a great place but it has its faults and they lie deep underground where the earth literally moves. The consequences are often devastating and fatal. 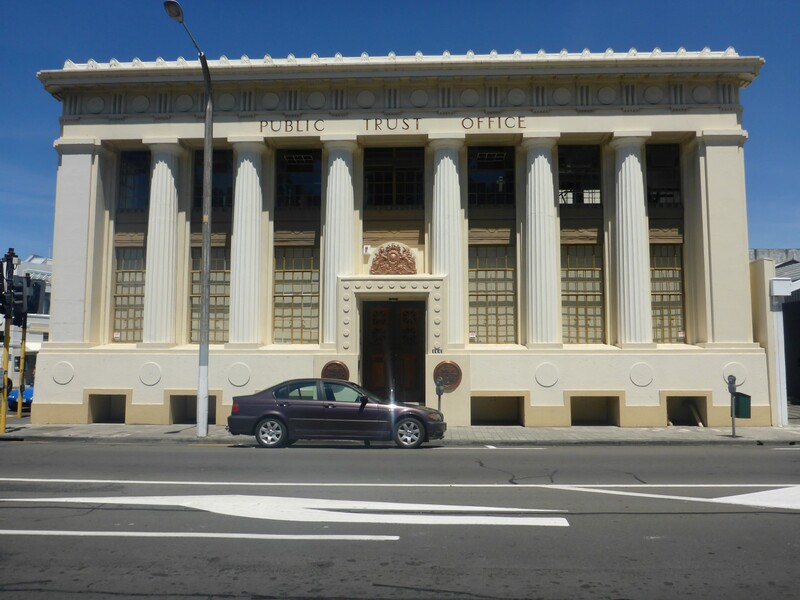 How does an old building get to be made quake proof? One method is to replace the foundations with piles and then sit the building on rubber rollers. It’s split horizontally at ground level and it is, literally, able to roll with the punches. This was the method used to make the old Custom House, which houses the Wellington Museum, quake proof. Other essential advice includes securing household objects to something solid. Being hit on the head by a flying TV would be a very daft way to die. 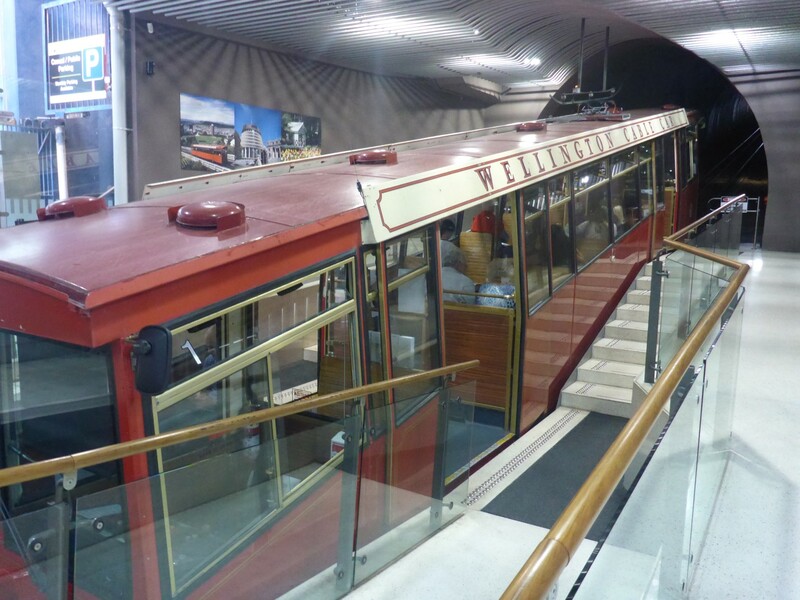 To give you an idea of how powerful an earthquake can be, Lambton Quay now sits at the heart of Wellington’s CBD. It used to be called Beach Street, because it was next to the sea. It is now 250 metres away from the water. Sea bed upheaval in the 1855 quake changed the foreshore completely. Seen outside the law courts. I picked up a leaflet describing a walking tour, which left the town hall at 10 am. As it is opposite the hostel it seemed a good idea to make use of it. Mark is about my age and he led our group around the various important city sights. 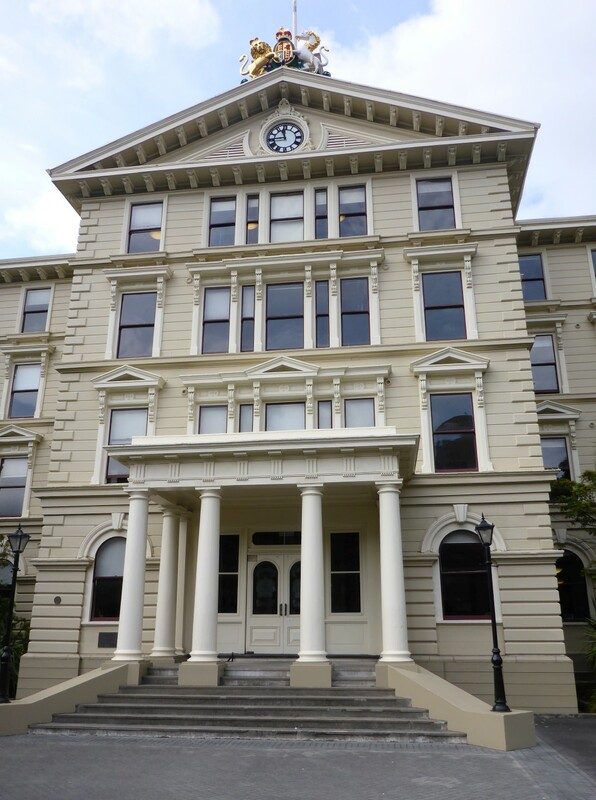 We saw the NZ’s largest wooden building, the former Government House. It survived the recent quake with little more than some cracked plaster, saying much for the hidden benefits of wood over brick. Former Government Buildings, made entirely of wood. 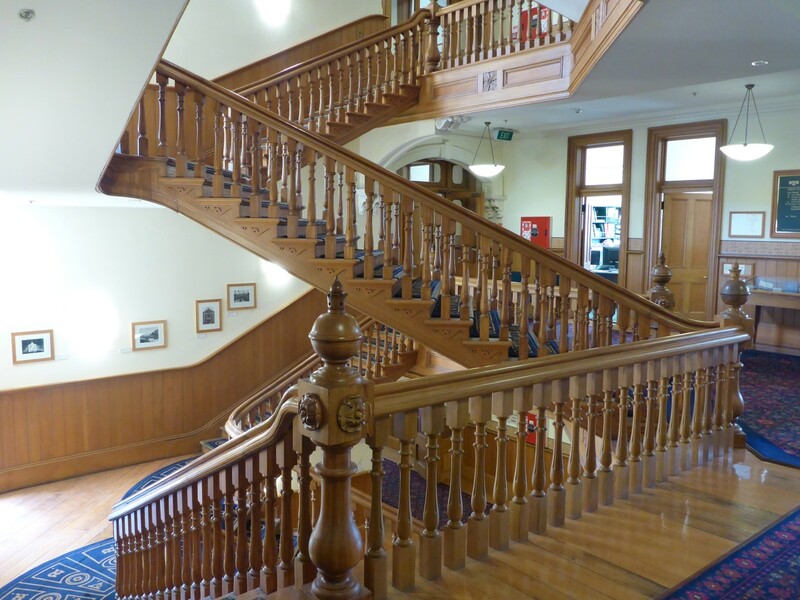 The beautiful, and rare, hanging staircase inside. One thing I particularly liked was the celebration of Kate Sheppard, one of the key players in the Women’s Suffrage movement in the late 19th C. NZ was the first country to introduce universal suffrage in 1893 and there is a statue of Kate near the parliament building. The thing I liked the most was that nearby pedestrian traffic lights have a green woman, in 1890’s style dress, rather than a man. A very neat, and typically Kiwi, touch. I took a trip up the city’s funicular cable car to the Kelburn Lookout and Observatory which overlook the CBD. There is a nice museum about the cable car’s history and I then had a fascinating hour or so gazing at the stars in the planetarium. The accompanying exhibition is great, with plenty of hands-on things to keep all the children there entertained. I spent plenty of time walking round the CBD and along the quayside. The port has moved further out of town now so the quayside is more of an entertainment space these days. There was a celebration going on relating to the city’s founding so there was a band and kids in fancy dress, all trying to have fun in the blustery wind and threatening rain. There are a number of plaques set into the walls of the promenade celebrating various events during the last century. There were many US servicemen and women stationed in NZ during WW2 and there’s a plaque in their honour. More poignant was the one commemorating the rescue of families, especially children, from Poland. 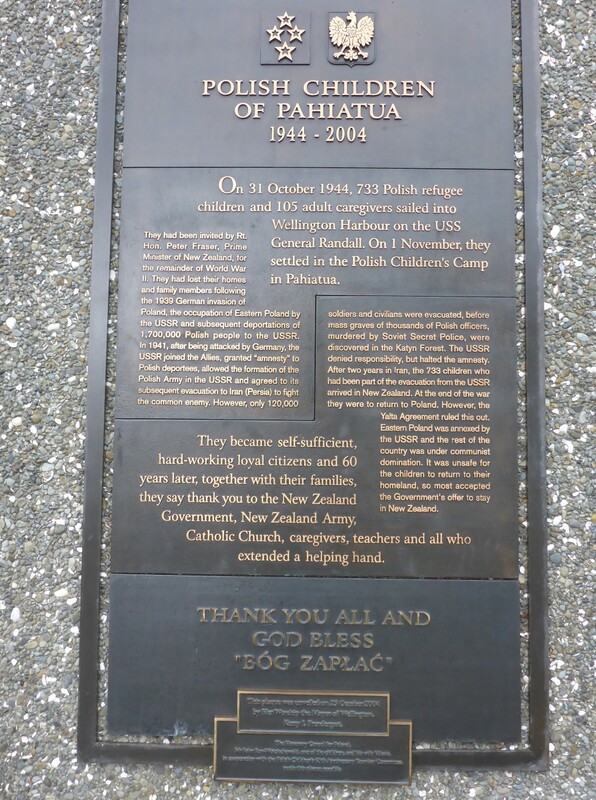 Plaque on behalf of the Polish children. I very much liked the 1926 steam ship that had a deck mounted steam crane on it. It looked really top heavy but had sailed to NZ under its own power from the shipyard where it was built in Scotland. 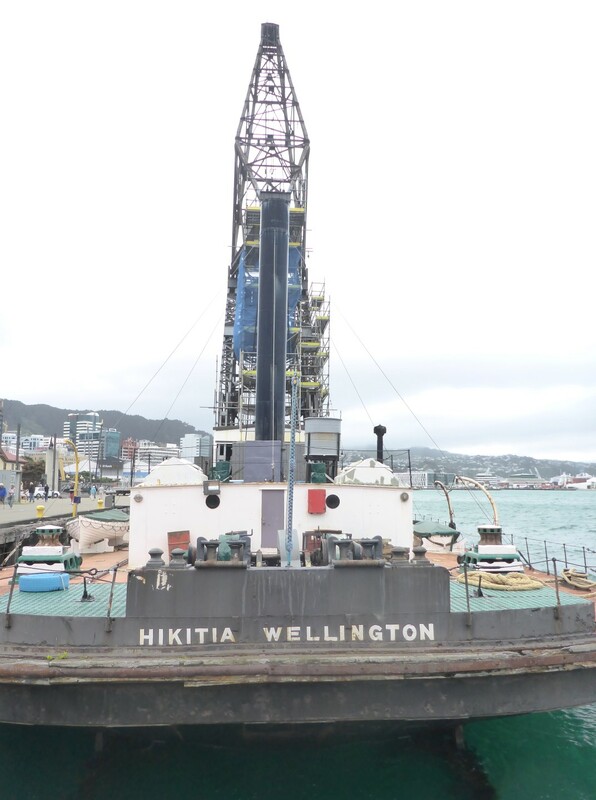 It’s under restoration but was in good enough condition to steam down to Christchurch after the 2011 earthquake, where it helped to clear the harbour. Pretty good for an old ‘un. Steam crane on steam ship. 1926, built in Scotland. the quay and one of the pedestrian bridges across it was built to act as a public space. 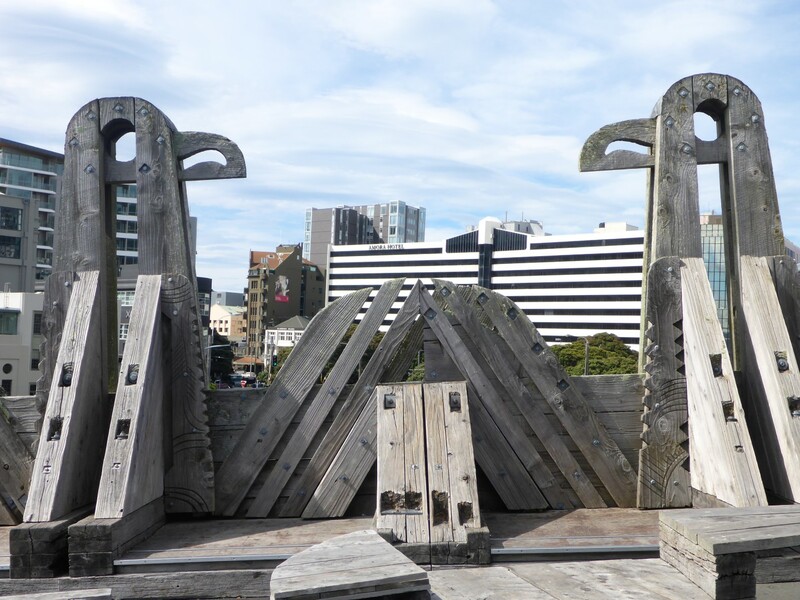 There are several sculptures, all of wood, reflecting NZ’s history and heritage and as well as being artwork they provide seating areas for lunchtime workers to enjoy some fresh air. Beyond the bridge is a public square which sits behind the town hall. 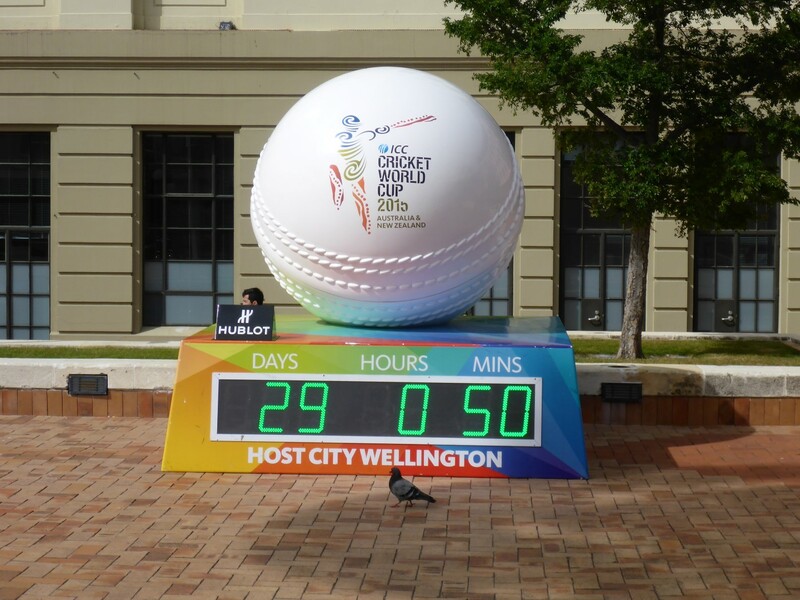 It has various sculptures in it but the main display related to the forthcoming cricket world cup, something that was being very strongly publicised. Looking forward to the Cricket World Cup. My final touristy action was to walk around the CBD taking photos of some of the older buildings, many of which looked good, others looking a bit tatty. 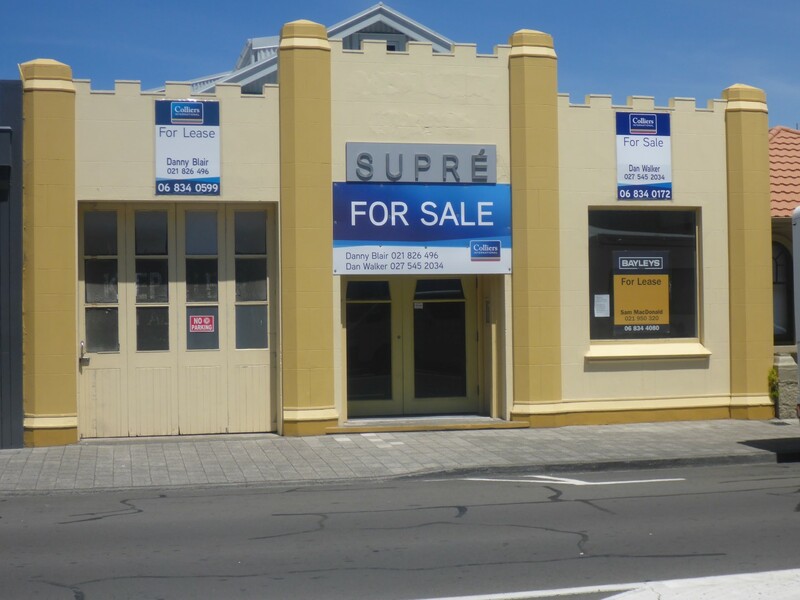 As in Napier, I saw a fair number of vacancies and it led me to wonder whether the fast growth of Auckland, at over 1.4 million was sucking the life out of other cities. 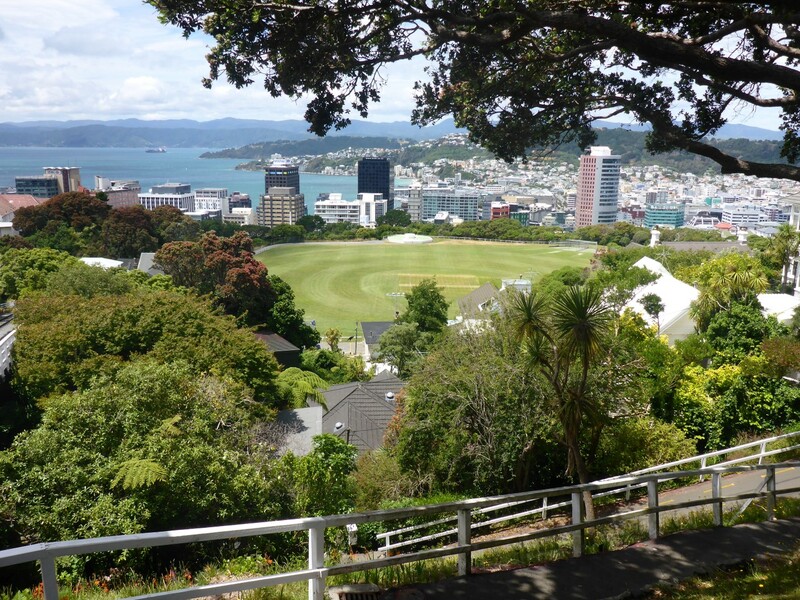 Greater Wellington has around 400,000 people, which is an increasing trend. So why all the vacancies? Puzzling. Wellington is a nice city to spend time in. 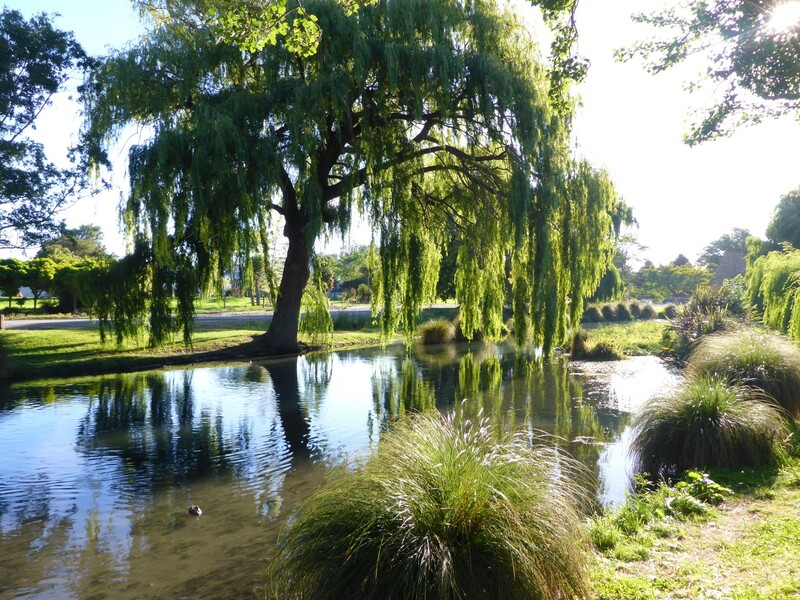 It has plenty to see and do, definitely an oasis in the ‘cultural desert’ that NZ is sometimes accused of being. There is good night life if you want it and plenty of people around to socalise with. I liked it very much. City view from the Planetarium. It is also the place from where the Inter Islander ferry leaves so on a damp and blustery morning I made the ten minute ride down to the port and checked in. 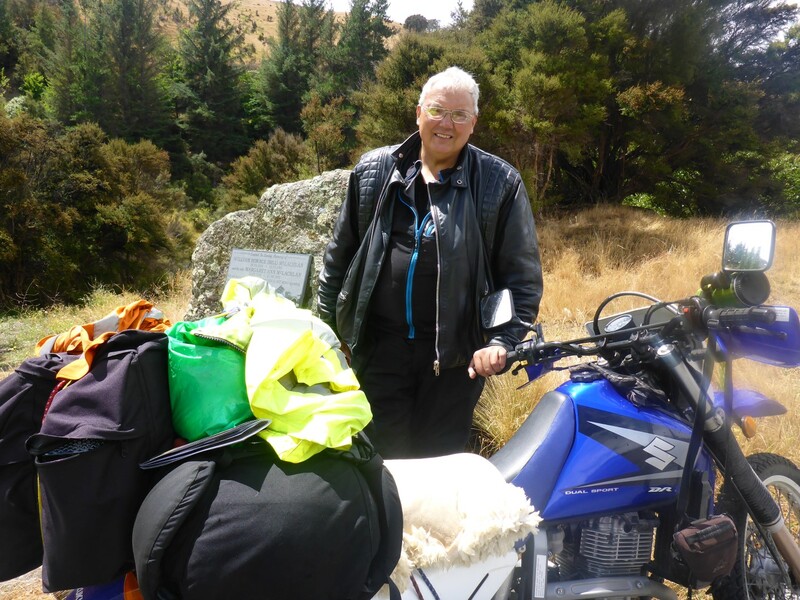 I met up with Grant and Ken, a couple of bikers from the south island, who had been riding some of the trails in the north. They were good company on the journey across and Grant gave me info on some of the good riding trails in the south. Just the job as I was keen to explore some of the back country roads. 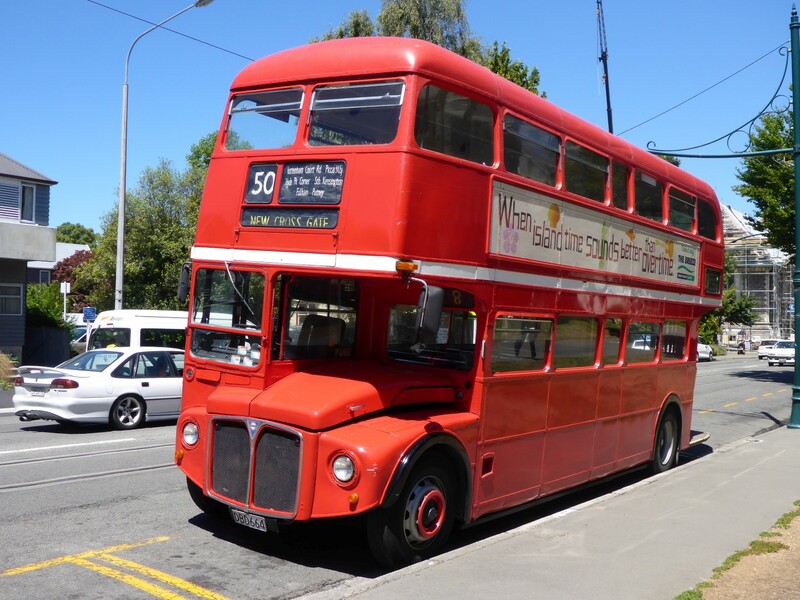 That included an alternative route to Christchurch so the fun would start soon. Ken and Grant. Both Geography teachers, so I was happy to take their advice on routes. 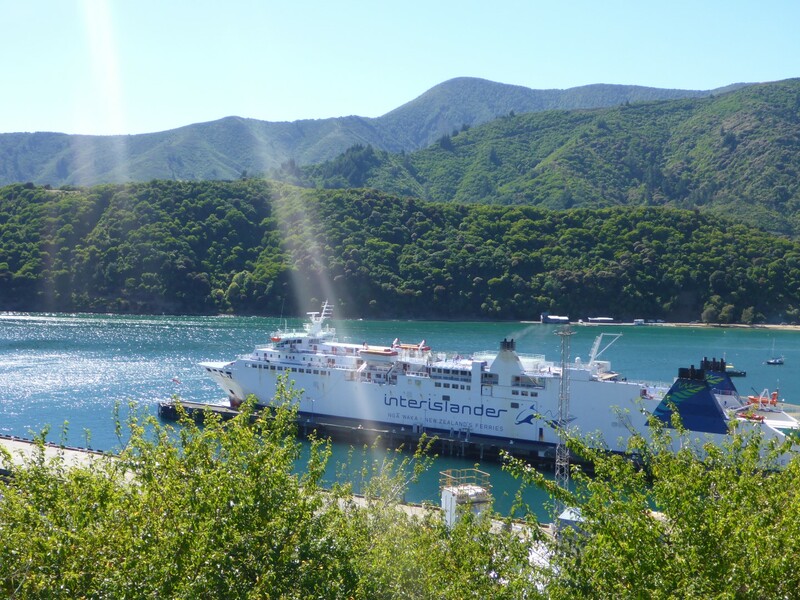 The ferry docks in Picton, a small town which is really just there to service the port. It has a small CBD but there was a good place to eat there and the essential supermarket for supplies. I tried to book a hostel in Christchurch but was struggling to find somewhere. 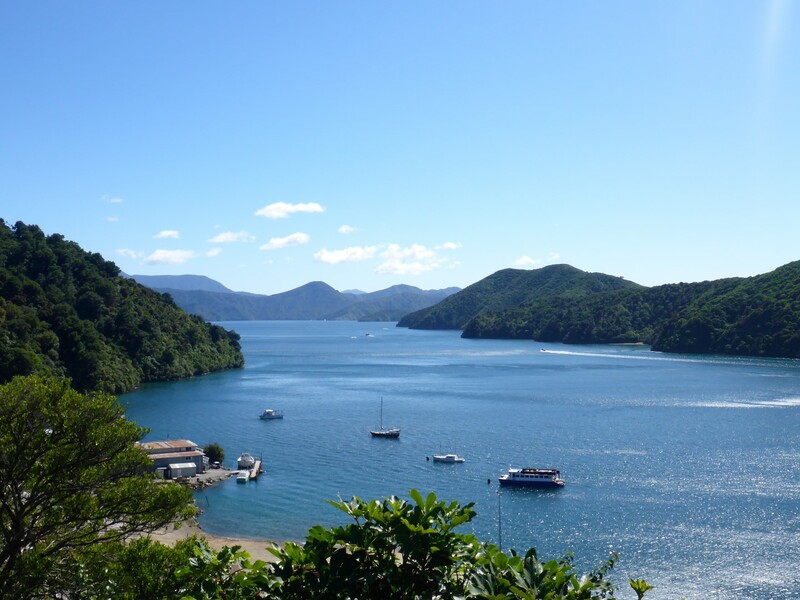 So I decided to stay in Picton an extra day, giving me the opportunity to explore the area around Shakespeare and Queen Charlotte Sounds. It turned out to be a good decision. There are some terrific roads for a luggage free bike and a bend loving rider and we had a great day out in the sunshine. I explored some gravel roads leading out to various pretty bays and beaches along the jagged coastline and came to the conclusion that this particular part of NZ’s coast was a true delight. Shakespeare sound. Pretty as you’ll ever get. 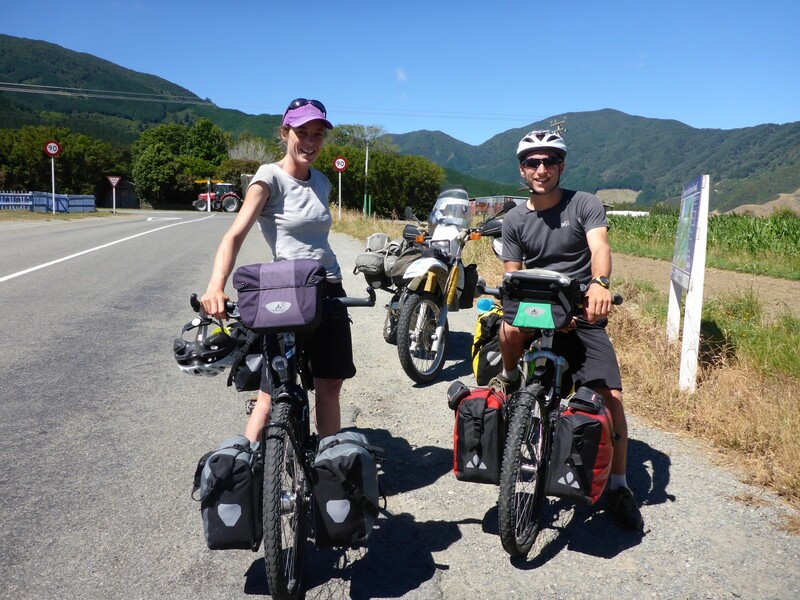 At one of the viewpoints I bumped into a young couple from Essex who had been travelling for nine months, and as I headed out towards the gravel trails I met a couple of French cyclists who had been journeying down through South East Asia and Australia for the last seven months. I love meeting other travellers and exchanging experiences. It adds to the enjoyment of being out in the world. I’m full of admiration for cyclists especially, but I’m pleased to see any youngsters getting out to discover the world before they settle down. It’s the right thing to do. Get pedalling guys, there’s a steep hill ahead! Bay by bay, by gravel road. Fun! Lunch was eaten next to a beach in a bay, coffee was drunk in a hotel in a bay too. The ride back was amazing. Plenty of challenging bends and once I was back on the main road I was pushing the bike hard into the very tight bends and really getting ‘on it’. Probably the most fun I’d had on the bike so far. I loved the way that occupants of cars waved as I rode by and whenever I stopped to admire the view other people would chat to me and I to them. This kind of behaviour is infectious and it makes time spent out and about very enjoyable indeed. I was surprised to see how many houses and farms there were, even right out on the distant spits of land. A mixture of holiday homes – a Bach, pronounced Batch in NZ – farms and retirees living their dream. The remoteness didn’t seem to trouble them and one guy was pleased to tell me how the local village store, closed for the past three years, was about to reopen. Picton was an hour’s drive away so they needed it. 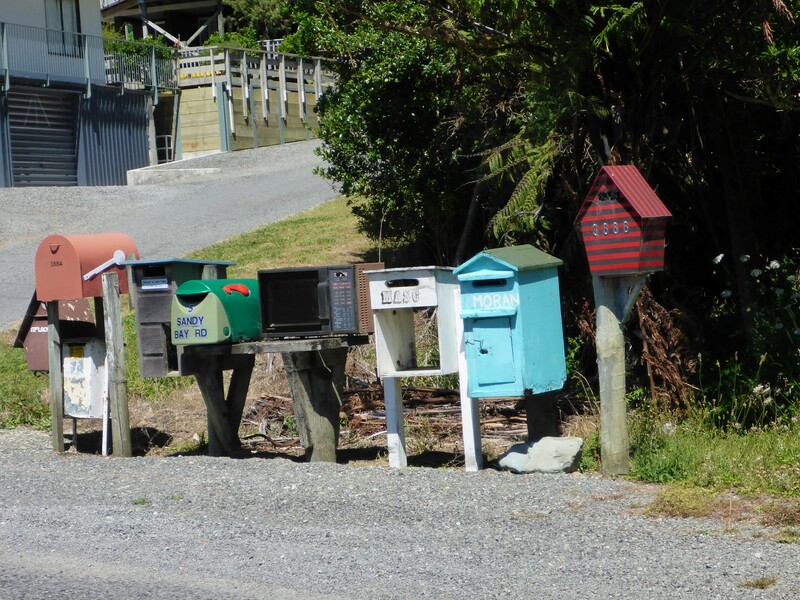 Many of the properties were up quite long dirt tracks and it became common to see a small collection of mailboxes standing in a row where the track joined the road. ‘Mailman, bring me no more blues.’ Impossible on a sunny day. Fortunately it tends to be wet in this area rather than cold, so access was unlikely to be a problem in winter. There were enough flat areas to support farms and the vegetation was green and lush. 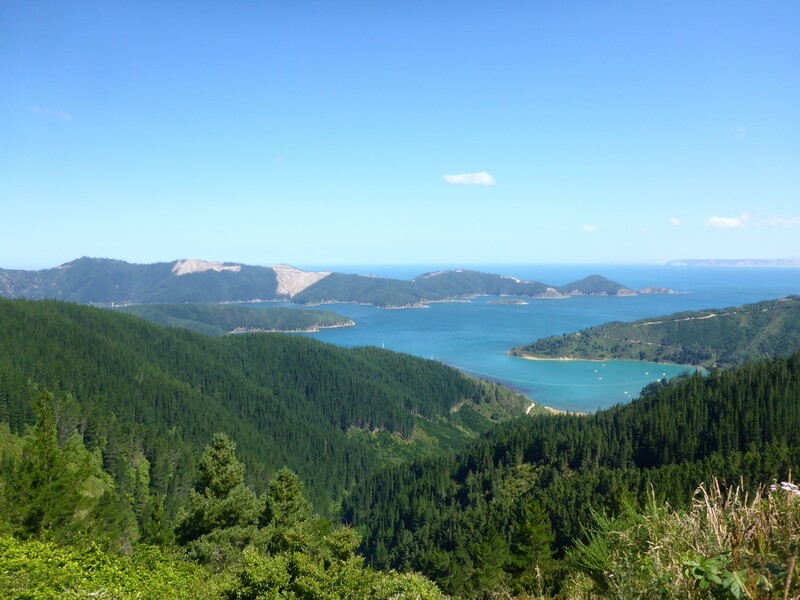 By the time I got back I’d reached the conclusion that the top part of the south island, with its stunning coastline, was one of the most beautiful places I’d ever been in. 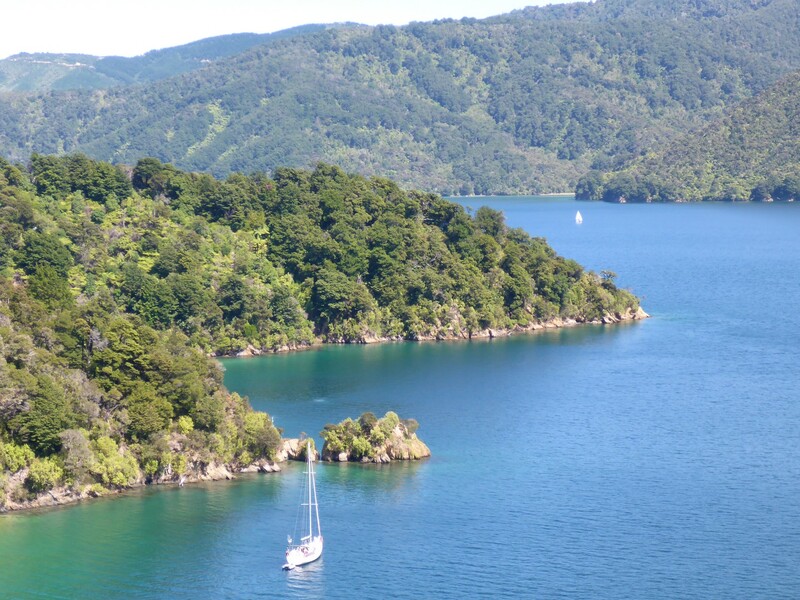 Queen Charlotte Sound. Beautiful coastline. When I left next morning I started the bike up and left it ticking over while I loaded my luggage. I was just about to go when I noticed some oil on the ground. It seemed to be weeping from the small access cover in the middle of the left hand engine cover. Damn! Further investigation revealed there was a crack in the slot where the Allen key fitted. It seemed the mechanic at Red Baron had been a bit heavy handed. I took it off and repaired it with some liquid steel. While I was waiting for the repair to go off I got chatting to Peter and his mother Gill. 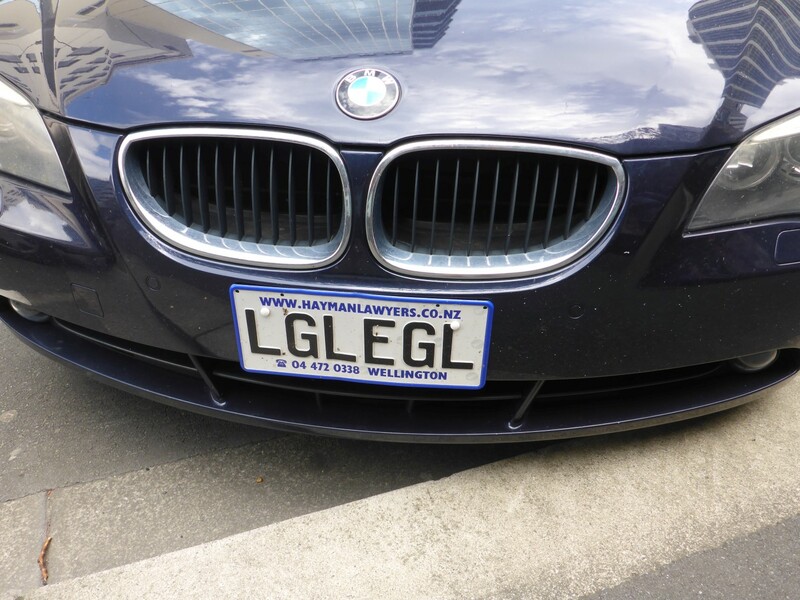 He was living and working in NZ with his girlfriend and Gill was out for a visit. She’s about my age and we passed the time very pleasantly. But eventually all was fixed and it was time to head off. Before I left I rang up Red Baron to tell them what had happened and they agreed to order a replacement for me to collect on my way back north. I made my way along the main road towards Christchurch and turned off to head to the Molesworth Trail. Molesworth Station is a government owned former sheep station which has been occupied by the same family for over forty years. It was a a run down failure when they took it over but they replanted the grass and introduced cattle instead of sheep. It is now a big success story. Replacing sheep with cattle was happening a lot in NZ and, as I was to learn later, it’s a successful business but has some environmental drawbacks. Dry countryside despite the river. One thing I noticed is how dry the landscape looked despite the fact that I was following the fast lowing Awetare River. But it tended to run in a gorge of varying depth and clearly wasn’t feeding the land around it. There hadn’t been much rain lately and it showed. 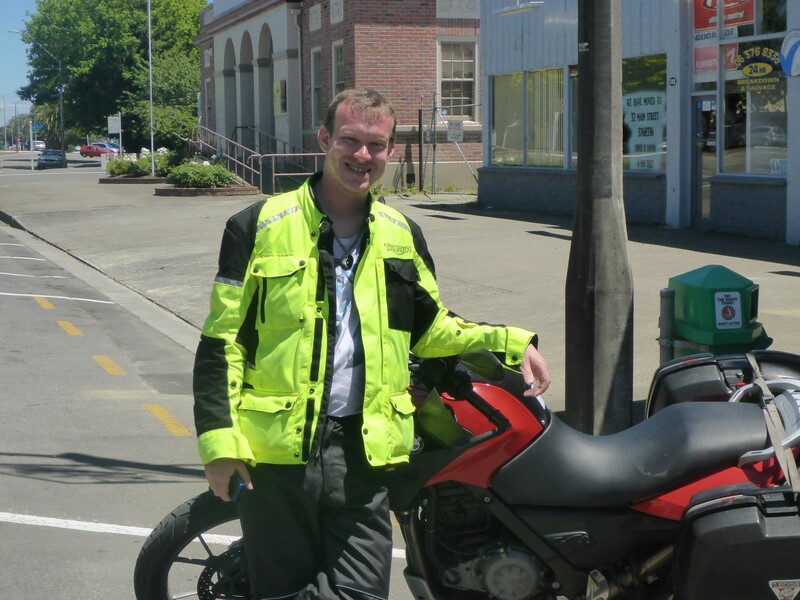 Rick and his DR650, a common bike in NZ and just right when you want to head for the hills. On the trail I met a guy called Rick, riding one of the very common Suzuki DR650’s. He had dual NZ/British nationality and had taught engineering in English schools. At one time he lived about three miles from my house and taught at a school less than two miles away. It is, as they say, a small world. After following the Awetare River for some time the trail went up over Mount Chisolm before following the Acheron River. The trail was great fun, mostly straight and fast but with some nice climbs thrown in. I was very glad it wasn’t wet because my rear tyre, although a Michelin off roader, was worn out. I’d fitted it in Japan thinking it would be great for the NZ trails, completely forgetting that the Japanese asphalt meant it would be worn out by the time I got there. As I came off the Molesworth and hit the blacktop for the run into Christchurch it started raining so my rear tyre and I took it steady and reached my pre-booked hostel before dark. I had struggled to find a place to stay but this hostel had vacancies and was a bit cheaper than the others. When I checked in I could see why. The room was small, with worn out beds and a very old carpet. The rest of it was OK but definitely below the standard I’d seen so far. 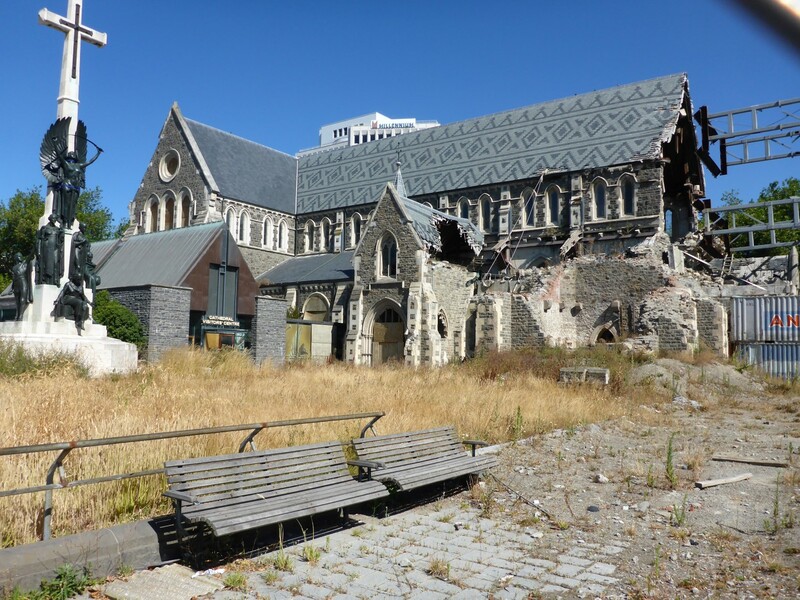 But the problem was that Christchurch was suffering from a shortage of housing following the earthquake and with the influx of workers needed to rebuild the city, beds were at a premium. So I didn’t complain and settled in. I was only there for a few days anyway as I was going to be staying with an old work colleague once he’d returned from his holiday at the weekend. A touch of Old London Town. The first thing I did was to contact my second cousin Bob. I’d met him once before when he visited England but that was way back in the sixties. My brothers had visited him recently and I was keen to do so too. 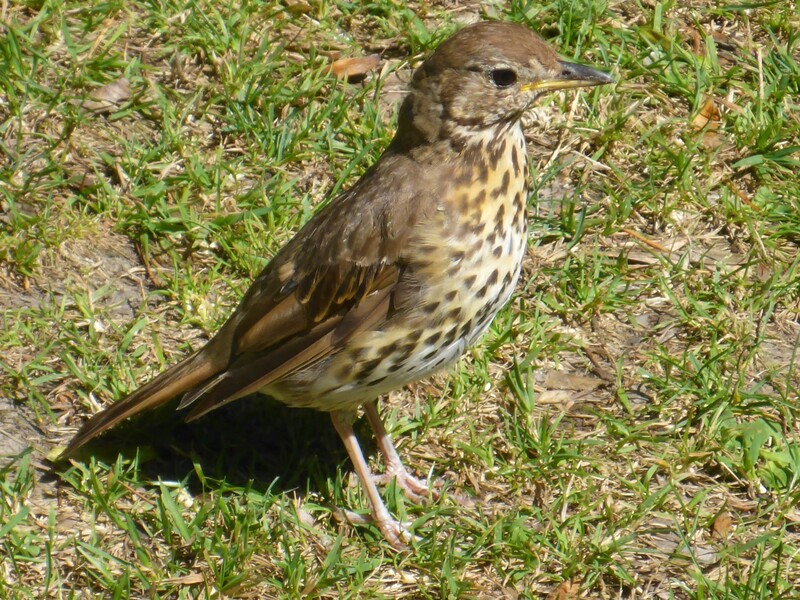 We had another second cousin in the city too and when Bob contacted me we arranged to meet at the weekend. Earthquake damaged building, and containers used as a barrier. Meanwhile I set out to explore the city. These days it is defined more by the earthquake damage it suffered, and the attempts to rebuild it, than any of the more usual tourist attractions. There were two quakes, one in September 2010 and the second in February 2011. The first one caused a lot of damage but only two fatalities, the second increased the damage further and took 186 lives too. Easily NZ’s worst natural disaster. Huge areas on the eastern side of the city have been rendered uninhabitable due to liquefaction of the ground. In these areas many properties suffered relatively minor damage but because of the risks inherent with the way the ground now is, the areas were red zoned. The houses have been pulled down and parkland has been created. In most cases this risk was not insured and many people lost out in a big way. Bob was lucky. The Avon River runs through the city and his house was on the safe side of it. On the other side there is only grass and bushes where once there was a large estate. As I walked around the city centre the devastation became obvious. Complete blocks of buildings were missing, now cleared and laid out as temporary car parks. 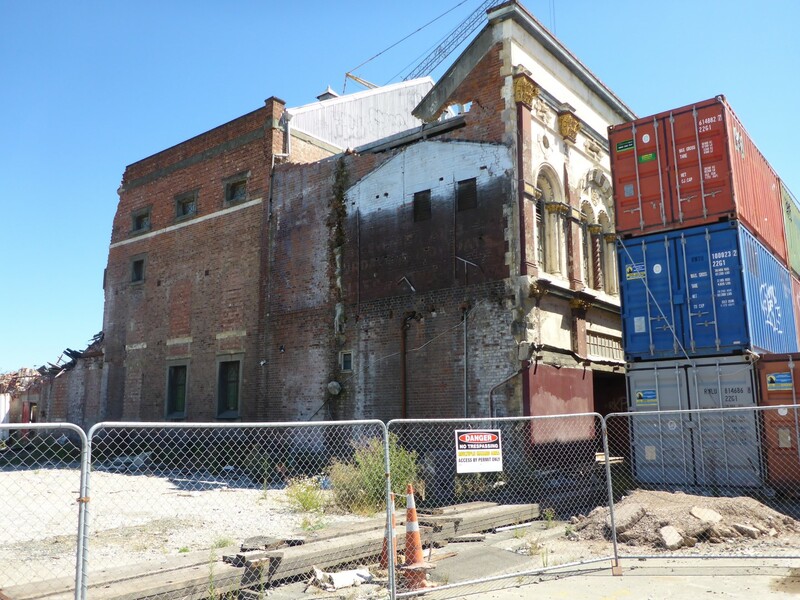 There are some very big building projects under way to replace the commercial space that was destroyed and there are also lots of ‘pop ups’, small businesses housed in sheds and containers. 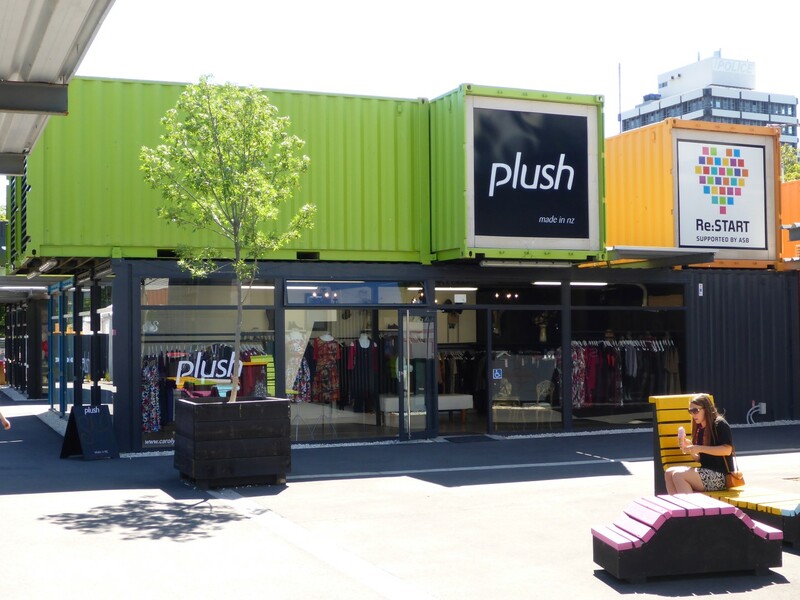 There is an area in the city centre where containers have been set up as shops and banks. The conversion from rusty cargo space to funky and attractive commercial space is amazing to see. Sometimes I had to look hard to realise what they came from. It’s incredible what can be done with a container! 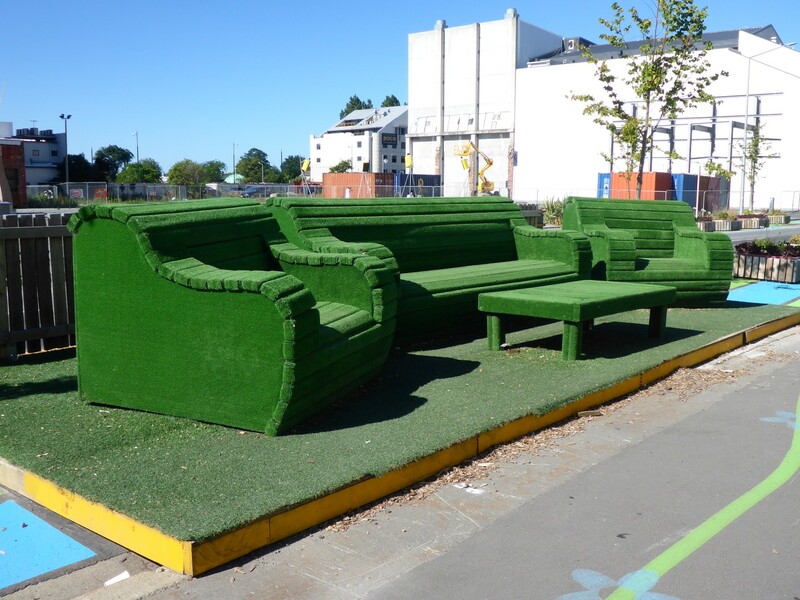 Christchurch’s version of Tin City. There are some nice art projects there too, such as the giant sized three piece suite. There is a nice tourist tram circuit around the city although I’m not sure whether that pre-dates the quake anyway. Sadly there are many buildings still in ruins and they have containers of the rusty cargo variety stacked up in front of them, placed there, I presume, to protect passers-by should the building collapse. Sit down, make yourselves comfortable. The one certain thing about everywhere in NZ is that it’s impossible to predict when and where the next quake will strike. 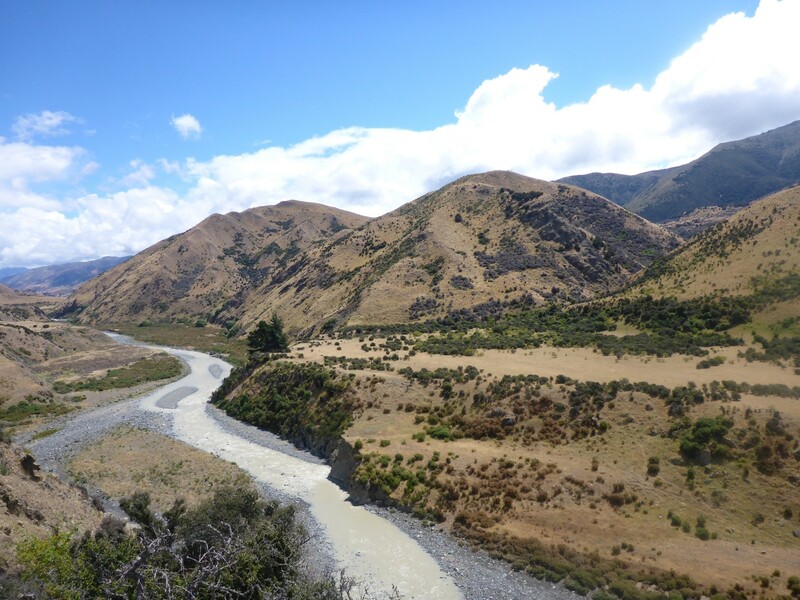 NZ sits on top of several known geological faults and is constantly at risk. Christchurch Cathedral. Still in ruins because the church doesn’t want to pay for it and neither do the citizens. 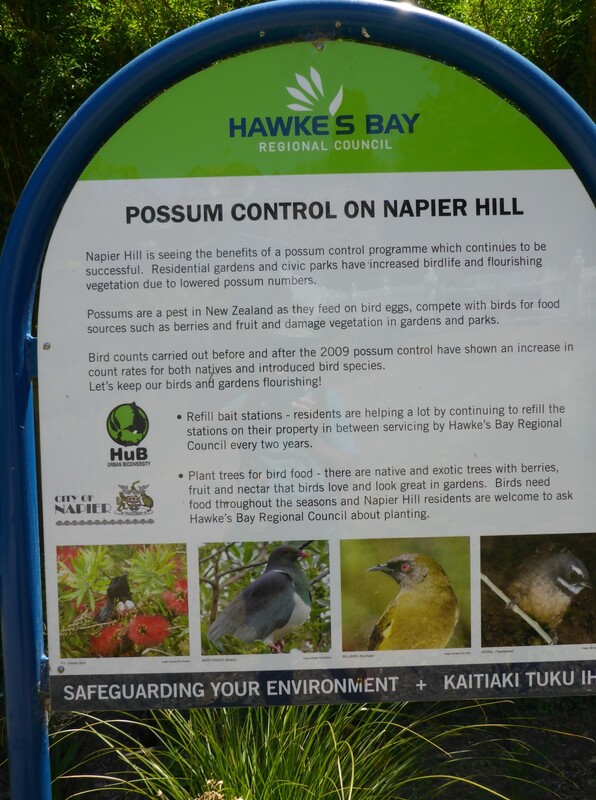 I met Cousin Bob and he showed me around some of the sattelite towns near Christchurch. 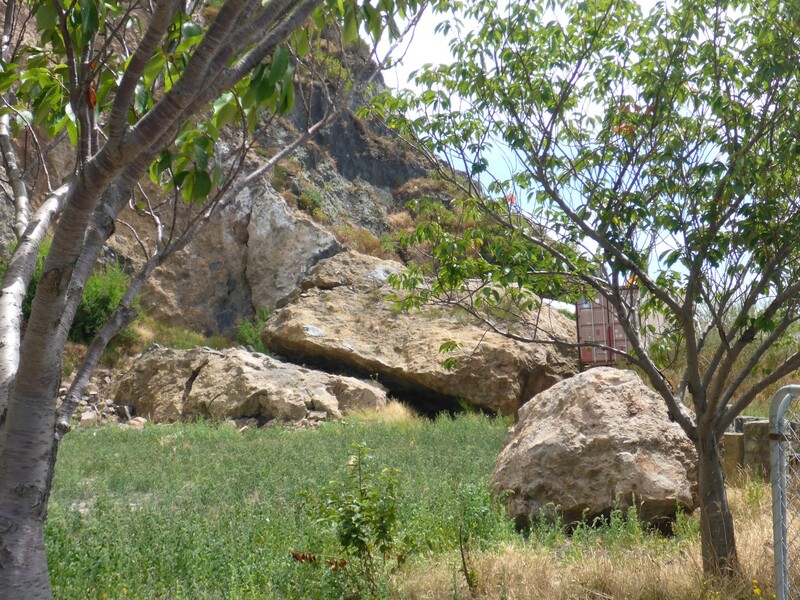 Many of them suffered quake damage and it was horrifying to see the lumps of rock, often as big as a house, that had fallen off the cliff. Some had crushed the buildings below them. 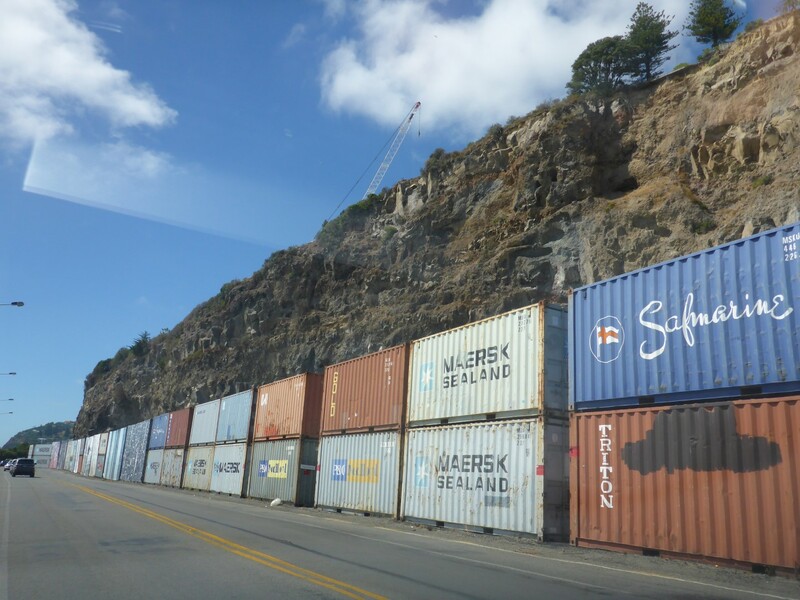 Once again there were containers stacked up in front of cliffs near the road, as protection. Big enough to crush buildings, Sadly, some did. 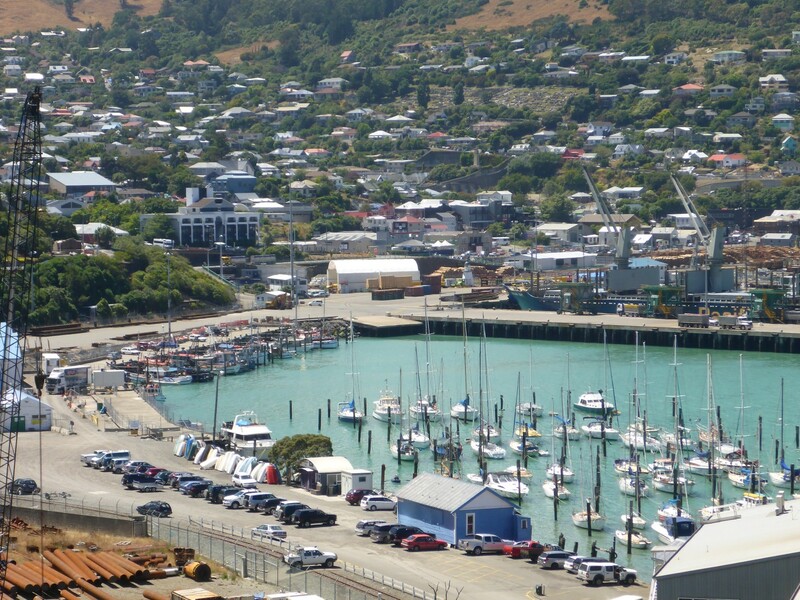 Bob showed me Lyttleton and its harbour. It was where he was born and raised, and he was very knowledgeable about its history. 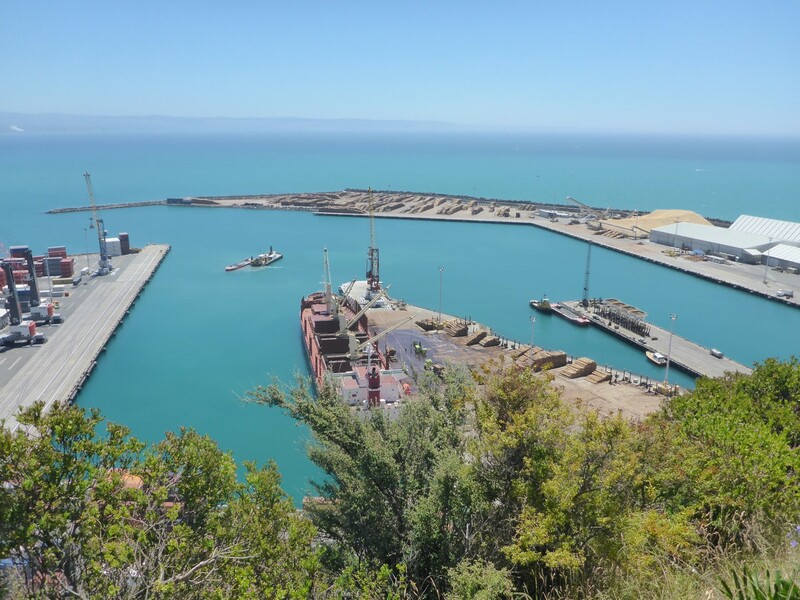 He was a carpenter and had worked in the shipyard there which has one of NZ’s two dry docks. Unfortunately the quake damaged the area to the extent that the lucrative cruise ship business had to go elsewhere. After a sobering morning looking around it was good to meet Bob’s family and enjoy a nice lunch. We also went to visit another cousin, Betty. She’s in her eighties and lives in retirement accommodation. There’s no doubt that it’s good to meet distant relatives and interesting that a meeting with strangers, but who happen to be family, tends to lead us into that comfortable family feeling very quickly and easily. Lyttleton Harbour. It suffered quake damage to the extent that the cruise ships can no longer dock there. It was time to attend to my damaged riding gear so I contacted Paul Delis, the guy that Fern had told me about when I was in Auckland. I rode over to his house was made very welcome. He is a retained fireman, a Fire Chief, in fact, and part of his business is to supply specialist clothing to the fire service, often specially made. He also imports KLIM riding gear, a very good but expensive product from the US. So, the crucial question was, ‘Can we fix it?’ And the answer was ‘Yes we can!’ At least, he was fairly confident his seamstress would be able to effect a repair using similar material to the laminated Goretex from which my riding suit was made. So I left my jacket and trousers with him and after a look at his collection of bikes, I headed back into town. He would contact me when the results were known. In the hostel I got chatting to a young Dutch woman who was keen to take a train through China, Russia and Mongolia. I dug out my Mongolia map and showed her were I’d been. I told her about the great hostel I’d stayed in when in Ulaanbataar, and of the tours they can arrange, and encouraged her to go for it. I hope she did. A walk in the park took me through the Botanical Gardens, which were very good indeed. 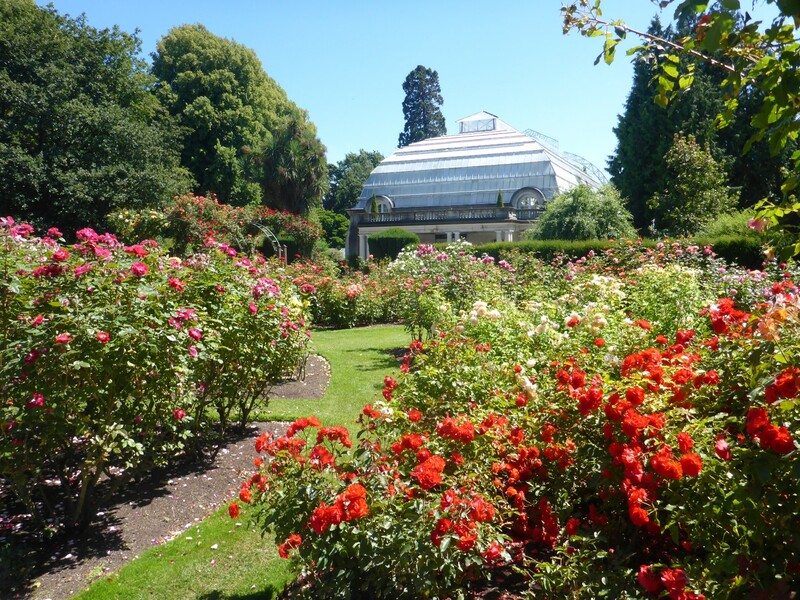 They are divided into various sections, including a huge rose garden, but I think one of the nicest things was to hear the variety of birdsong, particularly from the native species. Impossible to describe in writing unfortunately. Afterwards I met Chris and his girlfriend Lisa for lunch. I used to work with Chris in the energy efficiency industry in London and it was great to see him again and catch with his news. He came here about six years ago and has made a success of things. He continues to work in the same field, currently managing the roll out of smart meters for a large electricity supplier. Lisa is a very nice woman, funny and feisty. 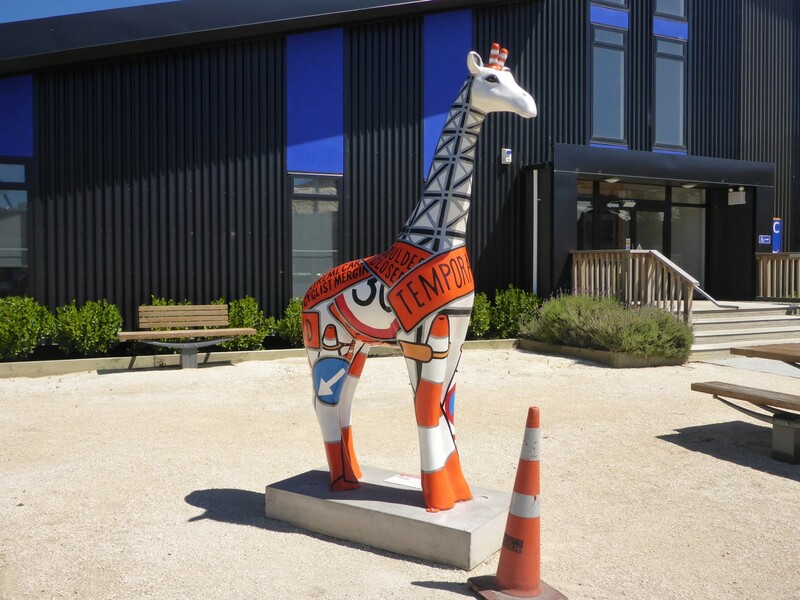 She worked in the UK for fourteen years before taking a teaching degree when she returned to NZ. I thought they made a great couple. Chris has a nice house, where he lives with his son Ryan, and I was going to stay with him for a few days. He has a lodger, named Norelle. She’s a very sport type and always seemed to be out running or cycling. Having moved to Chris’s I went to visit the city museum. 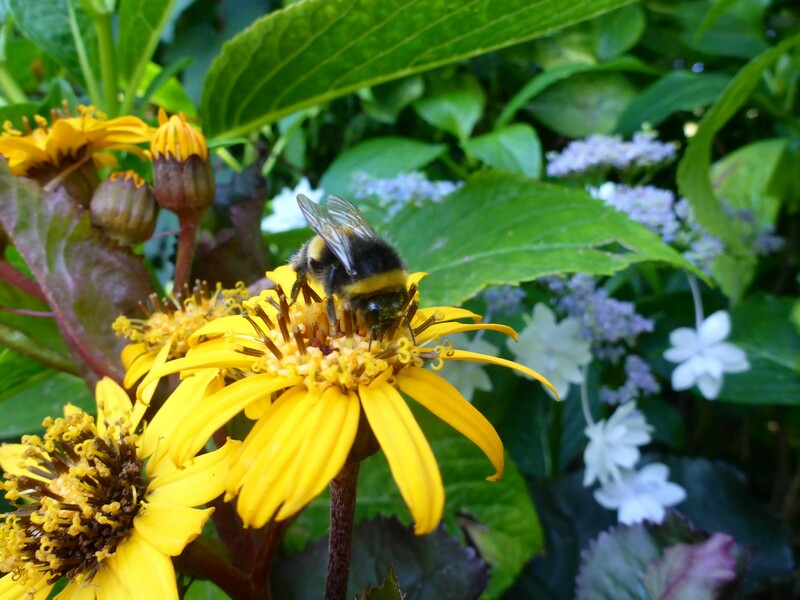 Plenty to see there – natural history, geology etc. But the most interesting section related to the city’s role in Antarctic exploration. Many of the famous expeditions left from there as did the often related rescue missions. There was a good display of Antarctic equipment, both ancient and modern. 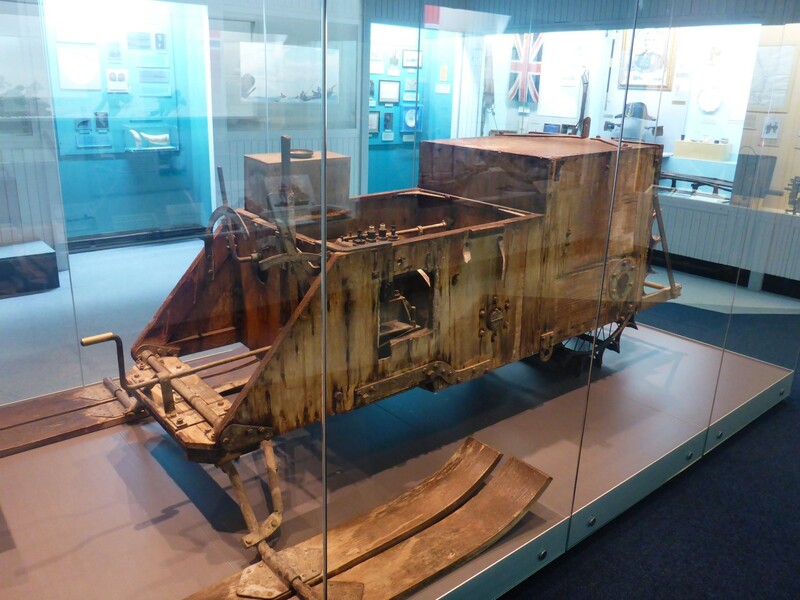 Antarctic sled, old school style. While i was at Chris’s I got some essential bike work done. I bought and fitted a rear tyre, a nice, meaty Shinko adventure type. Nice and cheap too at £50. I fitted a new chain slider, which goes on the front of the swingarm but while doing so I damaged the plastic chain guide, which is mounted beneath the swing arm, at the back. Then, while refitting the swingarm to the bike I forgot to reinstall one of the dust covers for the bearing, so had to do it all again. Is it just me? Please someone, tell me that I’m not the only cack handed idiot on the planet! By the time I’d finished cleaning the bike, and myself, I was ready for some good news. 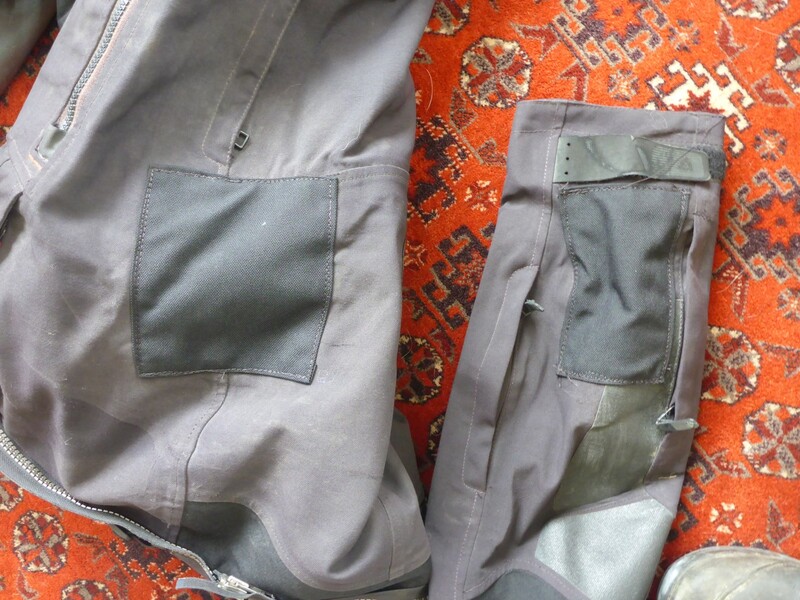 Paul Delis rang me to say that my riding gear was ready, nicely repaired, four patches fitted, all for about £85. I was delighted and met Paul to collect them from him. I promised to contact him on the way back north to go out on some of the trails he knew. That’s something to look forward to. 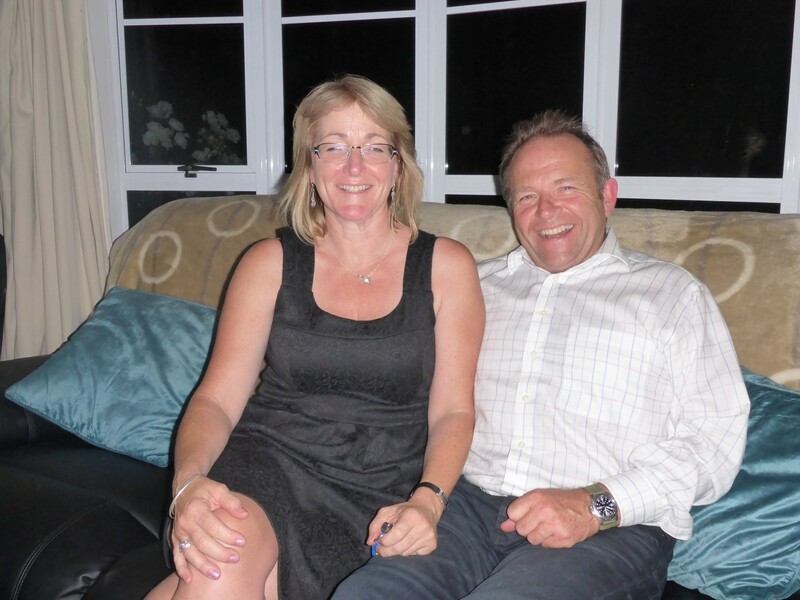 Out to a local pub that evening where I was delighted to be able to treat Chris and Lisa to a meal. They ordered Lemon Meringue Pie for dessert and caused a bit of a furore by asking for it to be warmed up! Not the done thing in NZ it seems. One thing the pub does, which I was very taken with, is to serve you your steak raw and then supply a hot stone slab on which you cook it at the table. A great idea and no-one to blame but yourself if it’s over or under done. I’d had a great few days with Chris, Lisa, Ryan and Norelle. The bike was now in fine fettle, apart from needing the new chain guide. But that wasn’t causing a problem although I took the precaution of ordering one from the local Suzuki dealer. 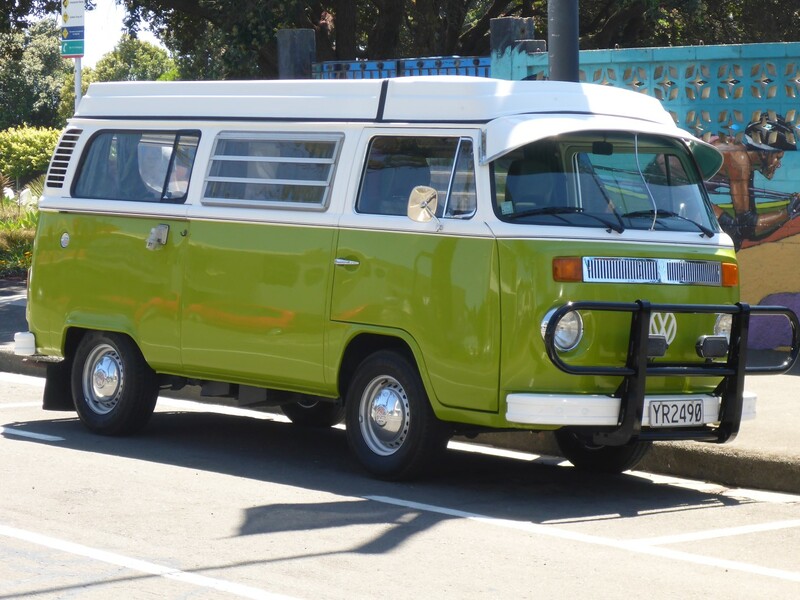 They were happy to have it delivered to the dealer in Dunedin for me, a place where I knew I’d be spending a few days. Now I was going to head out to Bank’s Peninsular, with plans to spend some time exploring and camping. Quiet and serene. The River Avon runs through the city.